It is a pretty strong statement to start off a post with something being ‘easier’ on the iPad. We have enjoyed having our files with us, edit/creating files and reading content on the iPad. But, all of those can be done on a notebook about as easy if not easier. Taking notes in our handwriting is a huge win for the iPad. 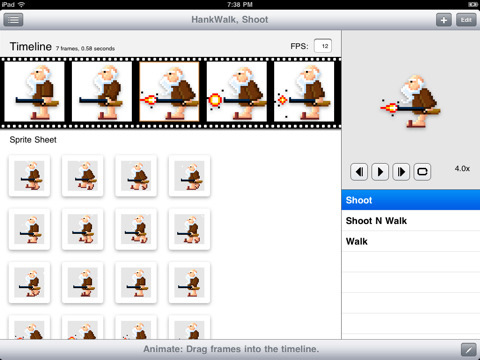 Now, we can add ‘making pixel movies’ to the list of wins for the iPad over other devices. Recently we were asked to put together a small movie showing several objects changing or actually morphing into other objects. Looking over our filming options, we explored Stop Motion and Cartooning. One of our team reminded us of a fun pixel level moving we made back in the mid 90s. We went looking for new software options that we could use. Nothing was really coming to the top of the list till we went back to the app store and found Sprite Something. Feeling a little silly we didn’t check there first, we dove in and soon had what we needed for the client. We will post up the final here later when the client clears us to. Meanwhile, why we went with Sprite Something. We found it much quicker to tap out the squares and swipe to the next screen than we could with a mouse on a computer. The software gives you a onion skin that you can work over or clone onto the next page for quicker creations of the next movement. 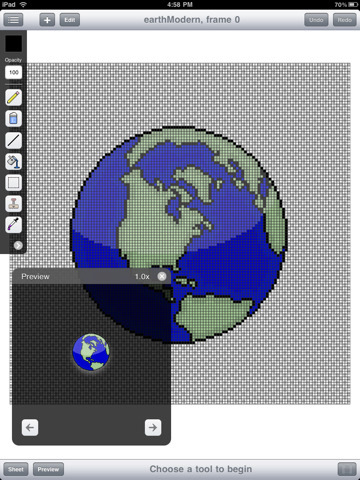 Unlike the option we used ten years ago, Sprite Something allows you to use colors (keeps a history so you don’t have to search to use the color on the next image) and you can add a photo background. Zooming in and out was handy when we were working on tight corners to get a more fluid look to the transitions. Sprite Something also has the ability to see an overview of the individual images on one page which made it easier to see where we went wrong and correct if things got a little off. To share out the final work (several people worked on parts that we joined together later) you can use email or the connection through iTunes when you have your iPad connected to you computer. Now that the work project is done, we are coming up with all kinds of little fun bits… a big hit for those with kids and a bit of imagination.